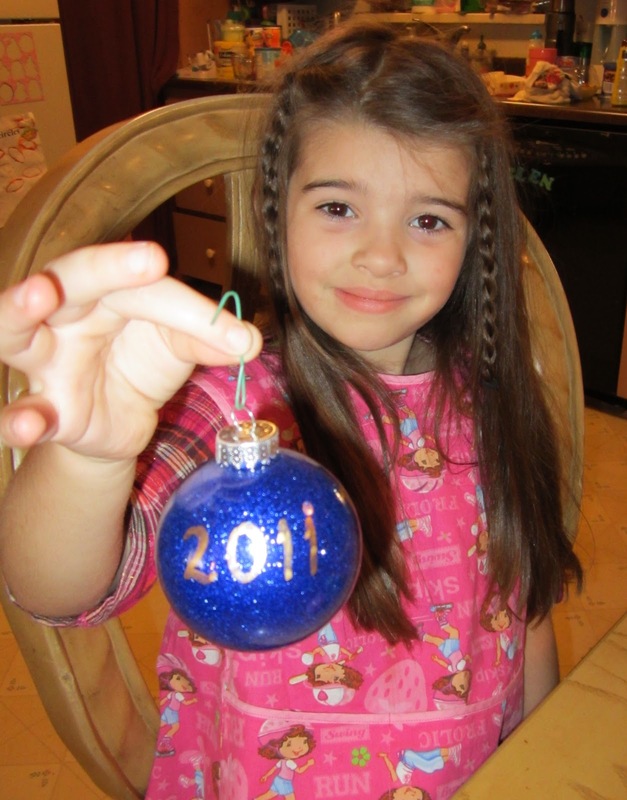 What would the Holiday's be like without a new ornament or two! 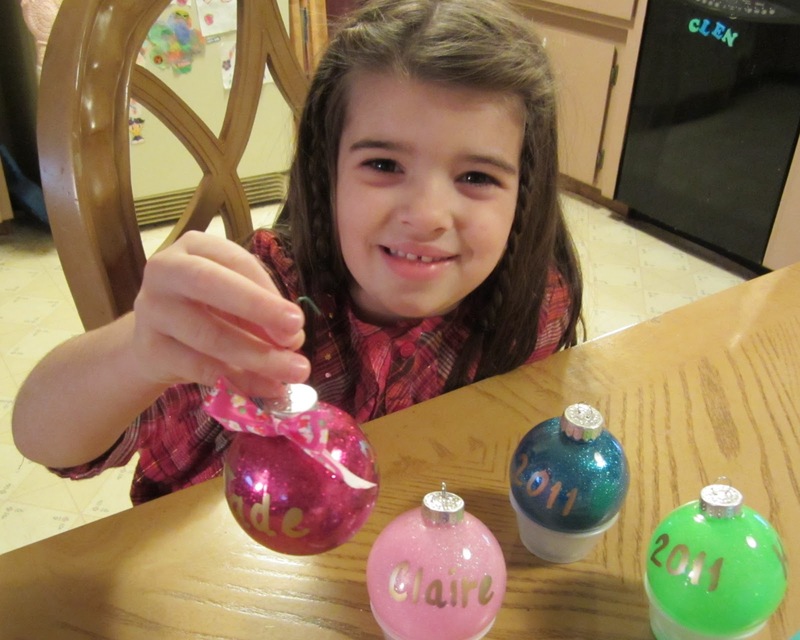 I've always loved making ornaments since I was a young child and after seeing a clever idea on Pinterest for making some awesome glitter ornaments I was determined to make some with my precious Granddaughter B! As I mentioned, I found this on Pinterest and the "Pin" led to the blog Everyday Cricut. Here is the link to the tutorial which includes a good video. You can also access the video directly from YouTube here. 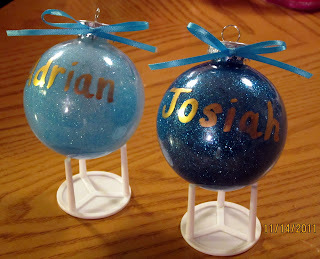 In the video it shows them using some vinyl letters cut from the cricut machine, but as you will notice, we chose not to use the cricut this time, we just wrote the names and year on the ornaments using a Krylon Gold Leafing Pen. 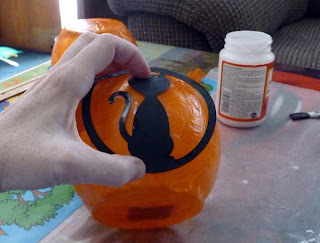 I also forgot to include the plastic wrap in the photo, but the video and tutorial at Everyday Cricut shows everything you will need. 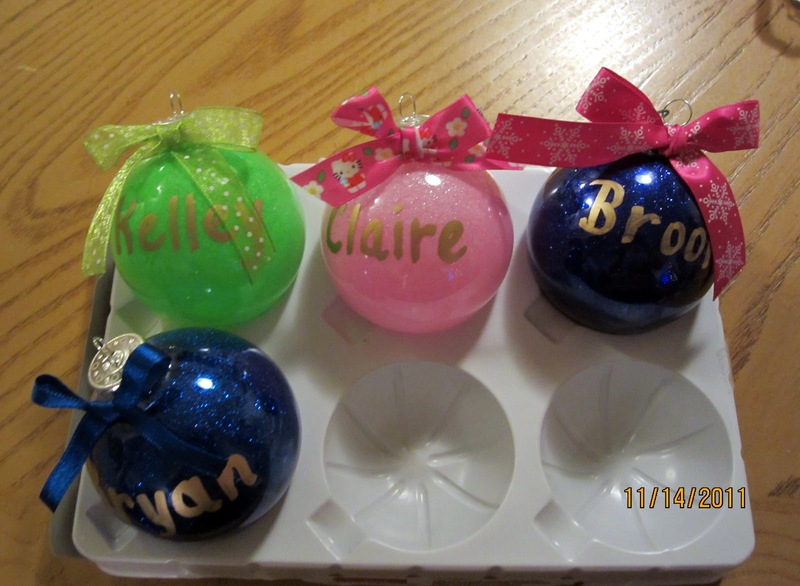 These ornaments were easy to make and came out so pretty! 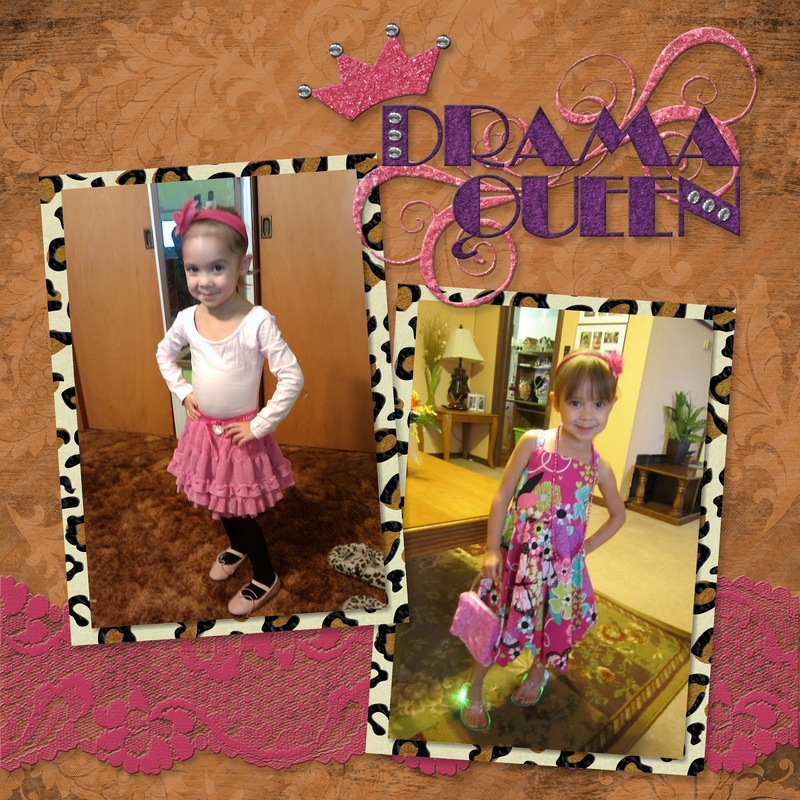 Even my 4 year old Granddaughter was able to perform most of the steps with just a little help from Grandma! She picked out all the colors for her cousins and her Mom, Dad & Sister and the ribbon accents also. She has really become my crafty little clone lately and we have so much fun! 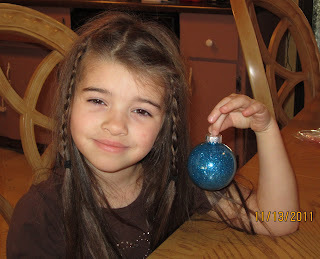 Sweet Little B was mighty proud of the final product! It still looked pretty and shiny, and really...from far away on the tree, you can't even tell the difference! Just something to remember if you are on a budget, because the coarse glitter was much cheaper than the fine glitter, (at least cheaper than the kind that is used for scrapbooking and card projects). 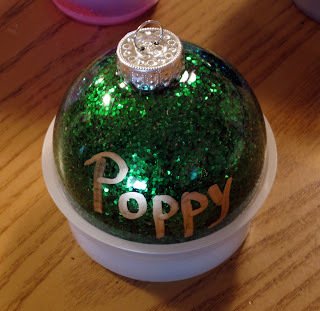 I did find a multi-pack of fine glitter at Michaels (Creatology Brand) that wasn't too pricey, but the amount you get of each color was so small, you wouldn't be able to do many ornaments with it. 1. Go easy and slow pouring in the floor solution into the balls and don't squeeze the bottle, (even though you will be tempted to because of the type bottle it is), because it will go all over the place quickly! 3. Keep a wet/damp rag handy in case some floor solution gets on the outside of the ball, you can wipe it off easily if you do it right away. 5. 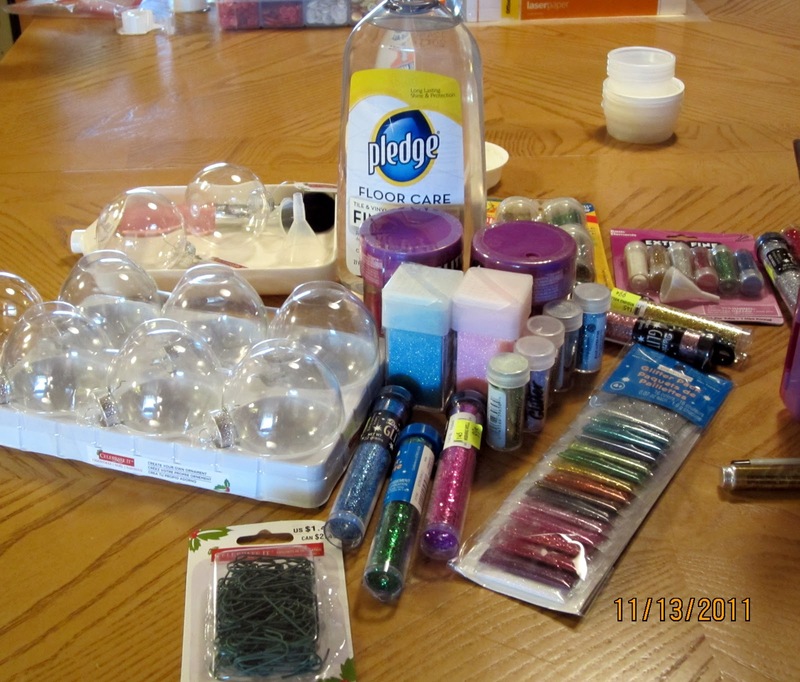 Save condiment cups and pizza box toppers (even if your Hubby makes fun of you and calls you a hoarder! LOL!). They REALLY came in handy here with this project. The condiment cups were perfect size to hold the balls while pouring in the floor solution and the pizza box toppers worked great to display the balls for photographing. 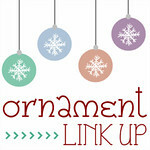 Thank-you for stopping by my blog and I hope you enjoyed the post! I am so excited about this Holiday Season! Christmas is my favorite time of year, even though things usually get pretty hectic around here during this time. 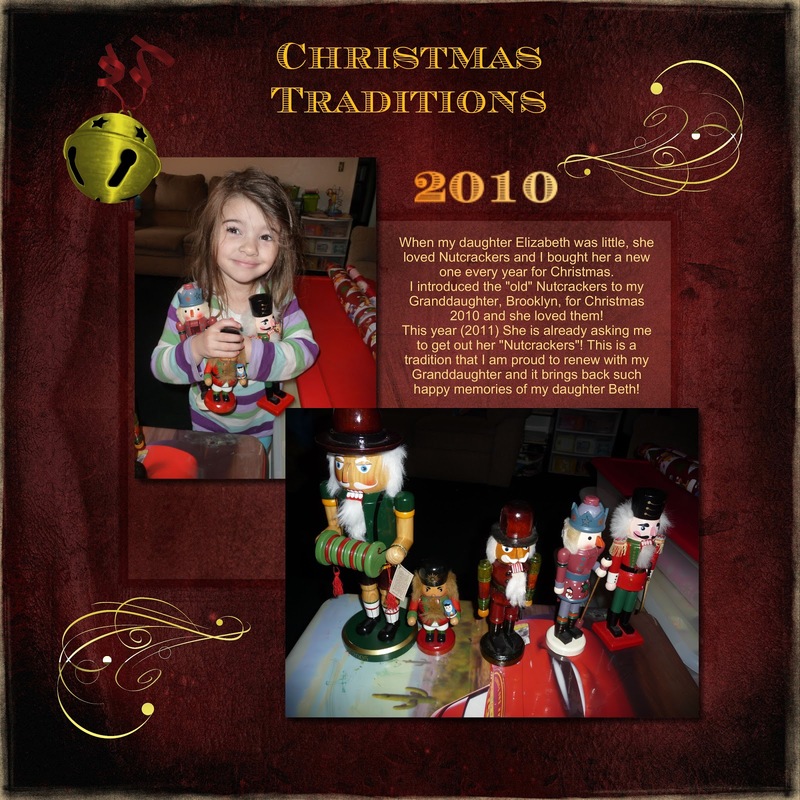 Now that all our children are grown, I often think back to the happy memories and traditions of Christmases past with them and one of my most memorable traditions is collecting Nutcrackers with my Daughter "B". How fitting that this week's "My Memories" challenge is about family traditions! I couldn't wait to get in on this challenge, as just last Christmas, my precious Granddaughter "B" also became very interested in the story of the "Nutcracker" after seeing a Barbie Holiday Movie "Barbie in The Nutcracker"
I was excited to share this tradition with her and immediately got out all of the old Nutcrackers that me and her Aunt had collected when she was a child. I snapped a few photos of precious little "B" playing with the Nutcrackers and hugging them like dolls! 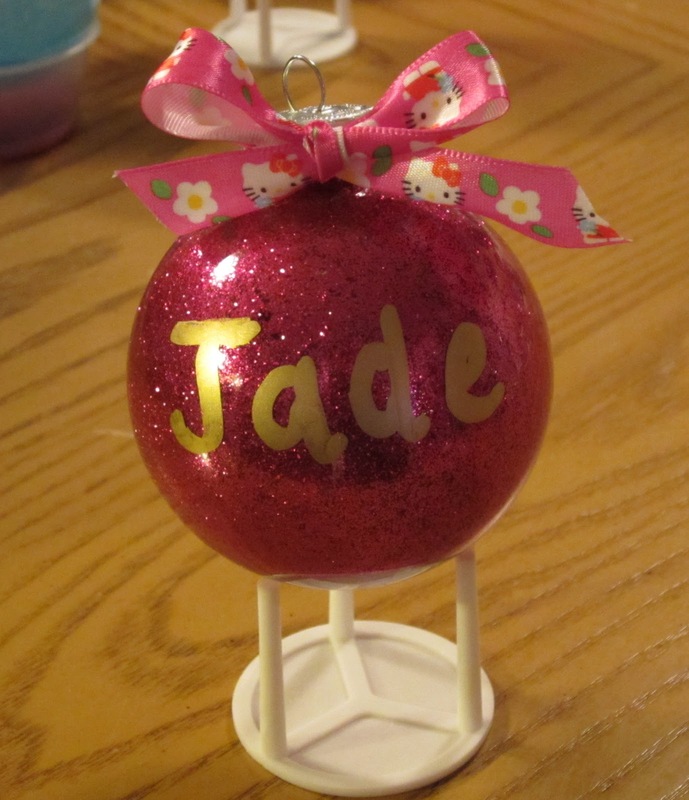 I even bought her one of her very own Nutcracker's for Christmas, to get her started on her own collection. I made it using the My Memories Suite (v.3) and it was so much fun and so easy! I just love all the options it provides and how quickly a page can be completed. I have SO many photos and just don't have enough time to do them all in the traditional scrapbooking method everytime. It's nice to be able to do some "digital" scrapbooking as well and get some memories documented quickly, before the photos get put on the back burner and left behind. As you can see, these photos are a year old and I hadn't yet gotten to them to scrap in a book. Another great thing about the My Memories Suite is that you can have your pages/albums printed professionally, so that you can have them handy to show-off to others just as you would with your traditional paper scrapbook! If you don't yet have this awesome Digital Scrapbooking Software, you can get it for $10.00 off by clicking on the blinkie below or on the ad in my sidebar and using the discount code that is below it. 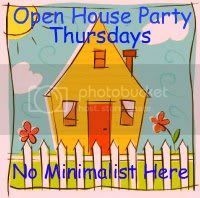 It comes with lots of great templates, backgrounds, embellishments, etc. as well as options to add other digital content. Their site contains lots of "freebies" too and other templates and quick pages that you can buy for a very reasonable price! The options are limitless with this software and you can create other items too, like cards and calendars. I was fortunate enough to have been given a copy of this software earlier in the year to review it for the company, but I can honestly tell you that I love it and would not promote it here if I did not think it was a wonderful product! I am amazed at what it can do for such a reasonable price and it's much easier to use than the more complicated and expensive programs such as Photoshop. I hope you enjoyed reading about my Nutcracker Tradition and looking at my layout! So happy you stopped by and I'd love it if you'd like to leave a comment and let me know what you think! I have been trying to get this post up for awhile now and I apologize for the delay. I have had some unplanned obstacles in my way this past week, including almost 3 days without Internet Service! My provider couldn't even give me a straight answer about what was wrong and they kept promising it would be fixed "soon". I finally gave up and figured they were stalling because of the Holiday. Sure enough, come first thing Friday Morning (right after Thanksgiving was over!) my service was magically restored! Oh well...it probably did me good to be away from the internet for awhile. Another issue I had, is a bad allergic reaction to some medication I took last night. Me & DH ended up in the ER, but thankfully it went fast and had a good ending! They had to give me some Prednisone which really helped. I was actually working on this post when it happened, my face began getting real hot and tingly and at first I thought my BP was up, then I finally went and looked in the mirror and almost screamed! My face had swollen up and had big welts on it (hives I am assuming). 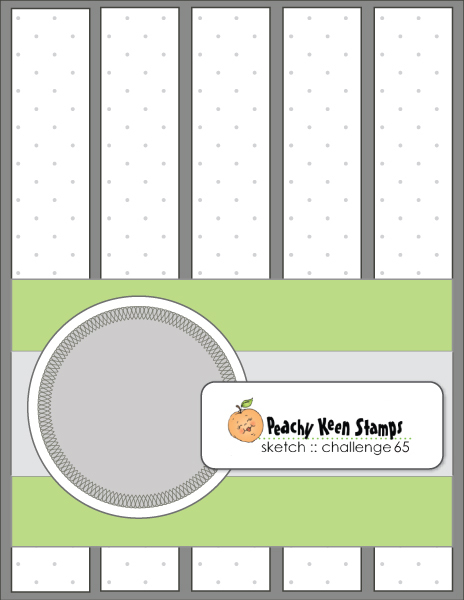 Thankfully, all the drama is over now and I can FINALLY get this project posted and in the challenge at Peachy Keen Stamps Challenge Blog! This challenge is a sketch with a TWIST! 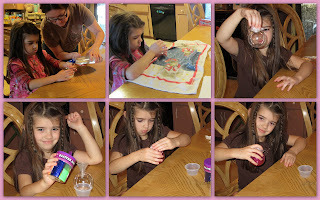 PAPER PIECING in your project! Not sure how to paper piece? Using your stamps, stamp individual elements onto different papers and "piece" them together! There's a great photo tutorial on SplitcoastStampers website - go take a peek, then check out the inspiration over at Peachy Keen Stamps Challenge Blog from their fabulous Design Team!! but if you've got them, they would LOVE seeing how you create with them! I really love Peachy Keen Stamps, but I have to admit that at the moment I only have the faces for the Cricut Dolls and one Easter Stamp, so I didn't actually use one of their stamps for this challenge, because I had a specific person in mind when making this card and wanted to use owls, so that is why. But I can assure you, I will be using them soon, because they are just adorable! If you've never seen them, you gotta go check them out! Their "Winter Friends" Bundle is so stinkin' cute! It's my favorite at the moment and I'm going to have to get it! They are having a 25% off sale on most of their items right now and 35% off on their exclusive Thanksgiving Bundles through November 28th! If you've never done this technique and need a good tutorial, you can go to the SplitcoastStampers tutorial that I linked above or there is another VERY Good video tutorial on YouTube by Stamped By Hand (Joanne B) that you can see here. 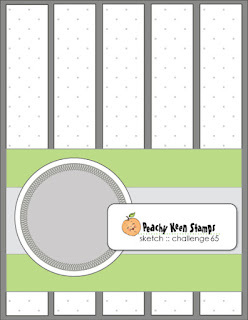 Hope you enjoyed my project and if you are inspired will join in on some of the Peachy Keen Stamps Challenges! 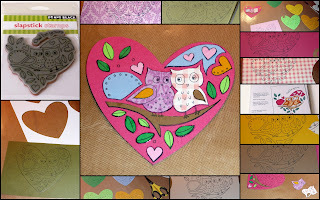 I have also joined a link-up party at Robin's Creative Cottage and have submitted this project/card there. It's that time of year again...The Holiday Season is upon us and of course for me that means at least a shopping spree or two at one of my favorite Craft Stores, Michaels! I have been so inspired and excited by some of the awesome projects I have been seeing and "pinning" on Pinterest the last few months, so I decided to pick-up some supplies to keep my creativity flowing this season! 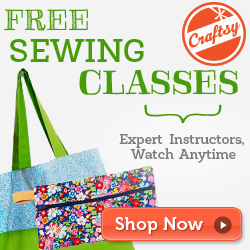 Check out my video of my most recent craft haul and see all the goodies I got! It's a bit long, but I had fun making the video, because I love to talk about crafting! Actually, I love to talk in general! LOL! He is such a great Husband though...he always tries his best to listen...even when I go on forever about nothing! Thank-you all for checking in with me and I will be back soon, (hopefully tomorrow) with a posting about the latest craft challenge I am entering! 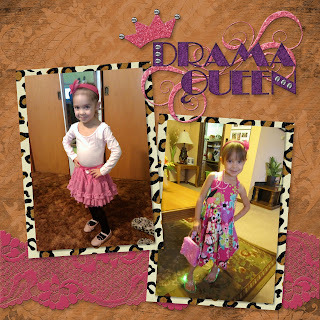 As most of my loyal followers already know...I usually post about crafty stuff, but that usually includes some tidbits about my beautiful Grandbabies as well and since this blog is also about the "Grandma Life", I'd like to post a little bit about that today. God has blessed me and Hubby with 5 beautiful Grandchildren and sadly, we don't get to see 3 of them very often because they live far away. So, awhile back, I started video recording myself reading stories to them, just as I would if they were right here with me! At first it was a bit hard for me, because I do not like to have my picture taken and I REALLY don't like to see myself on video. But, I realized that my Grandchildren love me just the way I am, flaws and all, so I just went with it! At first I just sat in front of my webcam and read the stories and just did a simple video, but as I went along, I decided it would be fun to add music and titles and make it look a little more formal. 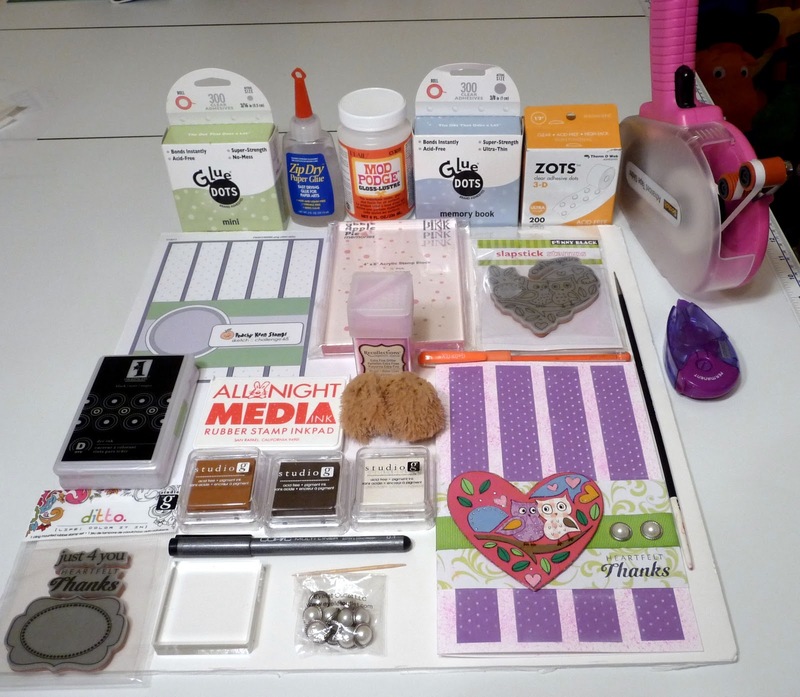 Recently I got one of those little "bloggie" type HD cams, (JVC Picsio) and I've been experimenting with it to see how it might work for some of my crafty blog videos. I decided to try it out on one of my Storybook videos for my Granddaughter "J" and even though I wasn't thrilled with the lighting in the room, otherwise, the video turned out pretty good. The best part is...My DIL sent a picture of "J" watching it with her Dog "Simon" and she looks so happy watching it, which just tickles me pink! That is all that really matters...is that my Grandbabies are well and happy!! If you are interested in seeing any of the other "Storybook" Videos I've recorded for my Grandbabies, just go to my YouTube Channel and you will find them all there! Thank-you all for joining me, I love talkin' about my babies! Yay! We Have a WINNER!!! Well, I didn't get as much participation as I would have liked for my recent giveaway, but that's okay, I still would like to thank all of you who did come by and visit me and sign-up for my free software giveaway sponsored by "My Memories"! I will be contacting you soon for details and instructions on how to download your full version Free "My Memories" Software. I am so excited for you to try it out, because I know you are going to LOVE it!! If you have any questions or need any assistance, just let me know. You can e-mail me by clicking the "Contact Me" link at the top of my blog. Giveaway! Giveaway! First Digital Layout & Software Giveaway! 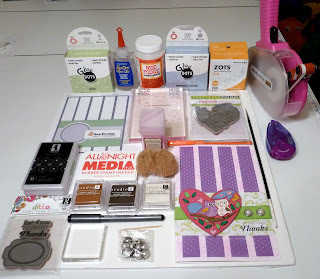 I am so excited today to share with you my first digital scrapbooking layout and a fun giveaway! 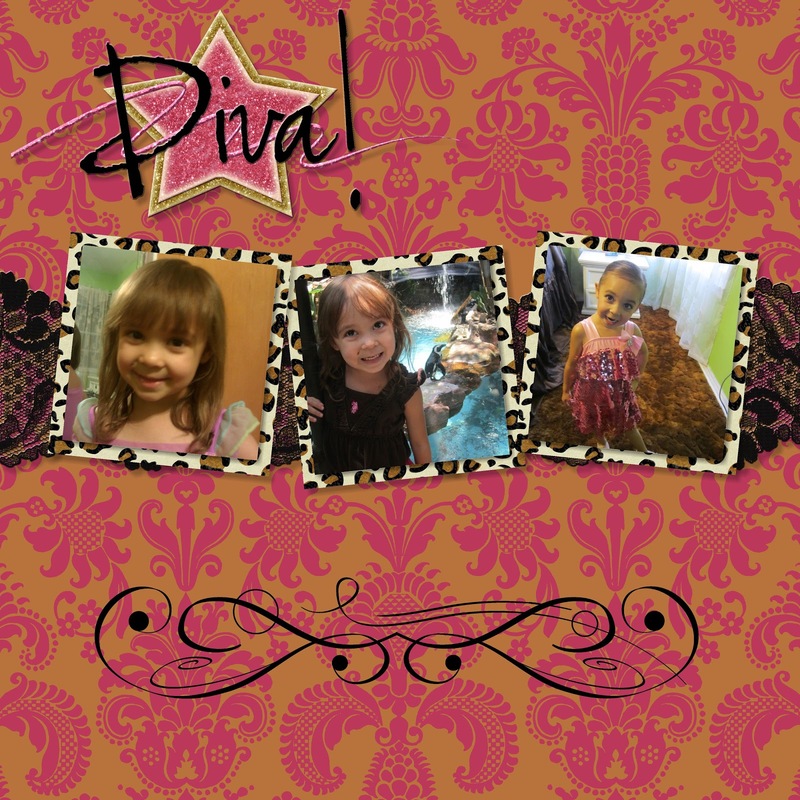 I have dabbled a bit in "digital" scrapbooking in the past, but could never seem to find suitable software that made it easy and yet look good. 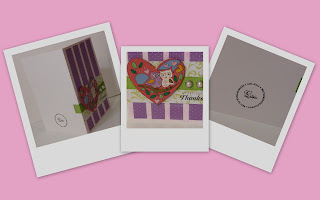 Well, recently I was contacted by a wonderful company called "My Memories" who asked me to review their digital scrapbooking software and see how I liked it and I was really impressed! 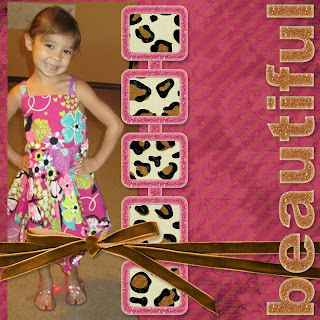 Their software is rated #1 on Amazon for Digital Scrapbooking and it is so reasonably priced. 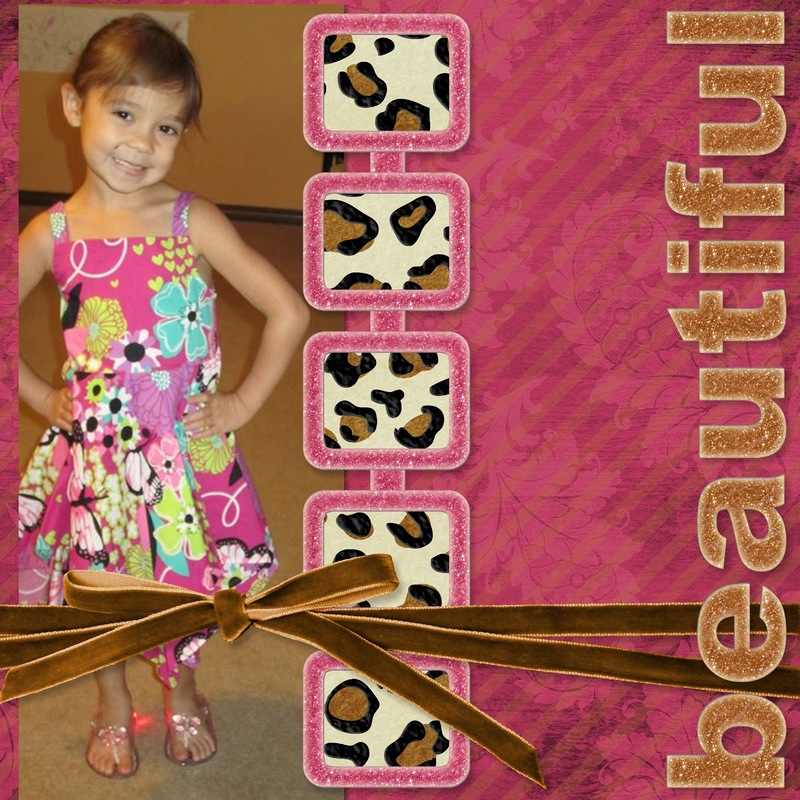 This layout features my gorgeous Granddaughter "J" of course and I couldn't be happier with the results! I used one of their included pre-made templates that came with the software and it was so simple with the "drag and drop" interface. 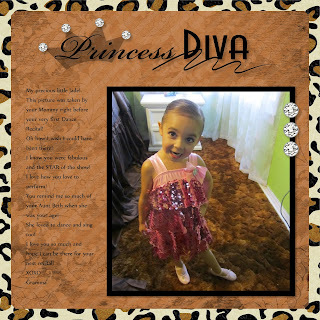 They have tons of templates and backgrounds to choose from, along with more you can buy or get for free on their website. You also have the ability to start from scratch and customize your layout anyway you'd like. You can even include music and videos into your layouts! 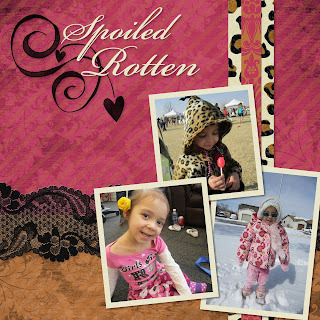 This software package does so much more than just scrapbook pages. 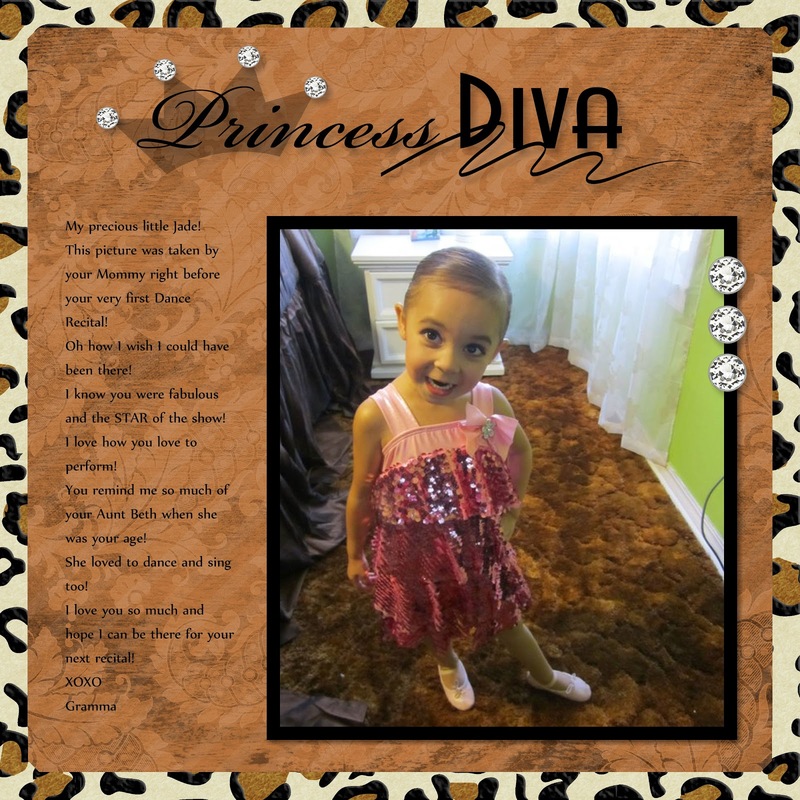 You can create calendars, posters, cards, invitations, personalized books and more! I love that you can turn your album pages into a beautiful personalized book that can be ordered in multiple copies and shared with all your family and friends! There are some great videos on there that really showcase everything the software can do and it's pretty impressive! Now here is the exciting news, they have given me an extra copy of the software to giveaway for FREE to one of my loyal followers! 1. Be or become a follower on my blog. Remember to be eligible to win, you MUST do at least steps 1 and 2, all other steps are for extra entries! This giveaway opportunity will be open through Sunday November 6th, 2011 and I will choose a winner via Random.org on Monday November 7th, 2011. If you don't win, don't fret! 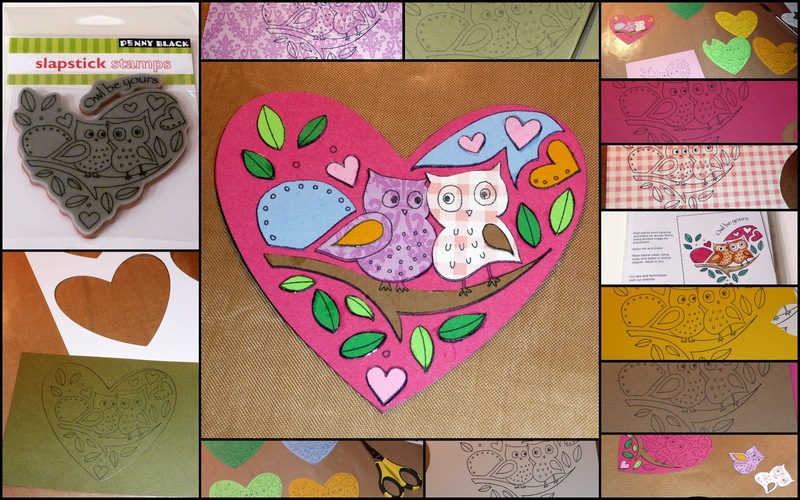 I'm looking forward to experimenting more with this fab scrapbooking software and sharing my results with you, so please come back again and see what I'm up to!